3M™ PELTOR™ Lite-Com Pro II UHF Two-Way Radio Headset provides hearing protection while making it easy for workers to communicate in high-noise environments with a built-in frequency programmable UHF radio. The two-way radio communications headset is fully programmable within the 403-470 MHz band and easily connects workers with up to 30 channels. Push-to-Talk (PTT) or hands-free Voice Activated (VOX) transmit functions make it easy to communicate in either mode. A wide and softly padded headband and deep earcups provide a comfortable fit for extended wear. A two-point suspension and wire headband with individual spring action help facilitate constant, even pressure where the earmuff cushions the head for a secure, comfortable fit. The earmuffs won’t cut off awareness of the surrounding situation; two external microphones allow the user to hear ambient noises and warning signals while still making face-to-face conversations possible. Noise-canceling microphone enables clear communications in noisy environments. Other features include selectable transmit power (high, medium and low), privacy sub-channels (CTCSS/DCS), and the ability for 12.5/20/25 kHz channel spacing. Powered by a rechargeable lithium-ion battery. 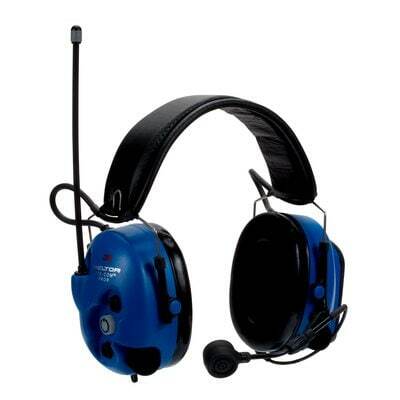 This headset has been rated to be an Intrinsically Safe Design by Factory Mutual Approvals with the specifications: Intrinsically safe, Class I, II, III, Division 1, applicable Groups A through G, T4, -20°C≤Ta≤50°C; Intrinsically safe, Class I, Zone 0, AEx ia IIC, T4, -20°C≤Ta≤50°C, hazardous (classified) locations.